So, I’ve painted up a load of Samurai and assorted other medieval Japanese bods lately and thought I’d give a quick rundown on some of the miniatures I’ve used and compare them. I’ve always loved the period, and had a load of miniatures in my lead pile intending to play more of Osprey’s excellent skirmish game Ronin, but all the publicity around Warlord’s recent release Test of Honour gave me a boot up the arse I needed to get cracking. 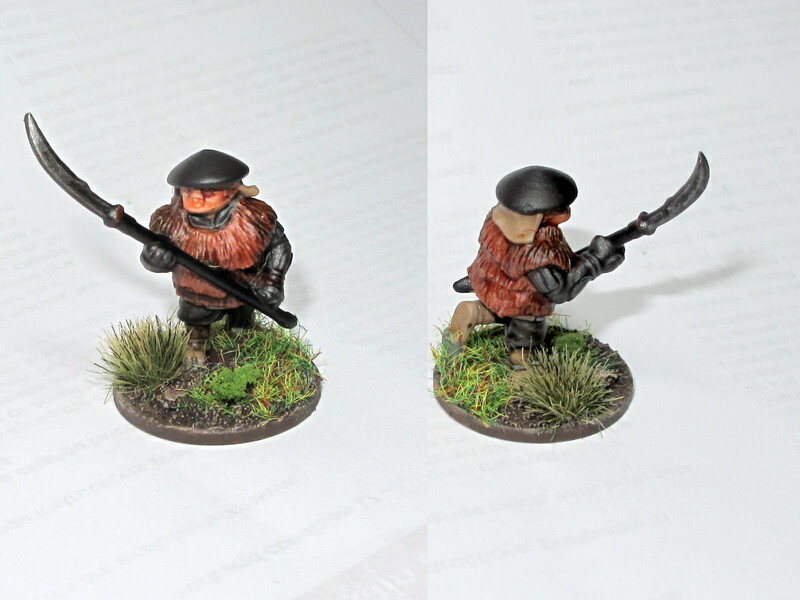 I’ve made one warband (“Buntai”) for Ronin completely out of Perry miniatures. The Perrys’ reputation goes without saying, and their Japanese range is up to their usual high standards. They’re realistically proportioned, well researched, and nicely animated. The only slight negatives I could point out are that Perry miniatures tend to be quite flashy and do need some time spent to clean them up. I suspect their moulds work pretty hard, and it shows. The other thing is the mad little boxes they pack them in. I know some people like them, but I hate the blighters. They’re also packed with a polyester fluff which snags on the models (as they are quite flashy there are lots of little bits to catch on) and being opaque boxes it means you can’t actually see what is what in your lead pile without opening every single box. Argh! Please Perrys, just pack them in blisters or clear plastic bags like everybody else! These two small negatives however are an issue with all Perry stuff, not the samurai range specifically, which in my opinion is the best out there for core battlefield troops. The Perry Japanese range is fairly extensive. They focus mainly on samurai and ashigaru, but there are a few civilians and irregular troops like ikko ikki. If you’re after an army for big battles you should find almost everything you could want. The only significant thing missing that I can think of is horse archers. Your only weapon options for mounted samurai are swords and spears. As per usual Perry style they’re not too chunky and slightly on the smaller side. Above is a warband made from samurai and ashigaru miniatures, for the Ikko Ikki below it’s a mix of samurai, ashigaru and one of their Ikko Ikki packs. The Ikko Ikki are nicely diverse and for a game like Ronin you’ll be able to use them as all sorts of irregular troops like bandits. Other notable parts of the range for skirmish gaming are their armed peasants, civilians, ninjas and some brilliant unarmoured Samurai which is basically a Koryu warband representing a sword school, all for £7. They’ve got a good range of warrior monks, but somewhat oddly the only missile option is the arquebus so if you want ones with bows you’re out of luck. TAG have a pretty good range of Japanese stuff, and I’ve got a few of their nice warrior monks. The poses are nice and dynamic. Their soldiers are best fitted to the Heian period (technically pre-samurai) so you’ll get lots of horse archers in old-style armour and tachis, with “followers” on foot. The followers are in lighter armour with a range of weapons while there are also unarmoured peasants, both would work as bandits or other non-military types. The monks and followers work for later periods such as Sengoku Jidai, the samurai less so. Size-wise they’re the same height as the Perry sculpts, but are noticeably chunkier. I’m using them as my Sohei monks, and some foot troops for the rebels. As mentioned above, if you want monks with bows this is the place to get them. Here you can see the massive wide face on his pumpkin head. The Princess. Whatever you do, don’t shoot her hair! Like all the Hasslefree stuff it’s a lovely miniature, and one that I don’t feel my mediocre painting skills have really done justice to. Looking back at it the white face is probably a bit silly unless she’s a geisha, but the sculpt is clearly supposed to look a bit geisha-like so I went with it. The rest of this lot are on my radar but I can’t personally vouch for them. There’s a lot out there! A smallish but quite interesting range. These seem to be quite naturalistically proportioned. Poses of the rank-and-file seem quite stiff but the characters are more dynamic. There are some “interesting” characters too, such as “not Zatoichi” and “not Yojimbo”! This range is small but covers a lot of ground. Specifically designed for the game Ronin there are six bundles each with about 8-10 miniatures representing some interesting forces, such as bandits, and some lovely unarmoured samurai from a sword school (Koryu). They also include Chinese and Koreans, which if you want to do the Imjin war are some of the few figures available as far as I know (the Perrys do Koreans, but no Ming). These are very nice miniatures, well suited to skirmish gaming, but quite pricey at £2.50 each for foot. This small range seems to be a decent variety of characterful sculpts, but to be honest I find it difficult to tell from the pics what they’re like in real life. They’re also listed as “25mm” so I’m guessing are on the small side. As part of the big bumper bag of moulds Warlord got when they gobbled up Wargames Factory, they got their Japanese range. The old WGF range was four boxes: foot samurai, mounted samurai, ashigaru with spears and ashigaru with missile weapons. Warlord still offer those as part of their “Pike & Shotte” range, but they’ve added some extra metal parts and a few figures to the range and released their new Test of Honour game. Most of the ToH figures are the old WGF sprues, in many cases with metal heads to differentiate them into the various ToH factions. Personally I think the WGF figures are not great. They’re very stiffly posed, and probably fine for an army of massed ranks, but I wouldn’t use them for skirmish gaming. Decently priced though, infantry at £1 each for the plain and £1.60 each for the ToH models, cavalry at £2.50 each. …or you can buy them with all the ToH bits such as metal heads, cards and metal leader figures. These look lovely, but are very expensive (most foot are over £3 each). You can find an interesting and fairly detailed review of some of the AW range here. These are from Foundry’s legendary back-catalogue, and in my opinion aren’t anywhere near the high standard of the more modern Foundry miniatures. The heads and faces aren’t well-sculpted and have really exaggerated Asian features that I feel are verging on insulting these days. Old, old sculpts, and don’t they show it. Seriously guys, what is up with these faces? Actually two slightly different periods on offer. The Genpei range is 1st Corps and also suffers from very dodgy faces (like their Chinese) but they also have a C13th Mongol Invasion range. Another range that seems suited for pre-Sengoku, as there are samurai but no ashigaru, and the armour style is earlier. There are a couple of good character models. Some of the smaller packs aren’t cheap, but the larger boxes are very good value. Designed for their games Kensei and Torii, these aren’t cheap, but some of the characters are very, very nice. Also includes some fantasy monsters. Well known for their Dark Age and VBCW ranges, they’ve recently added a Sengoku-period range, aimed at the Test of Honour market (they have bundle deals for the game). They’re the usual nice Footsore sculpts, mostly samurai and ashigaru with the usual weapons, but there are no cavalry, monks or Ikko Ikki. There are a couple of nice unarmoured samurai though. Unfortunately, like the recent Warlord metal releases for ToH they’ve decided to hike the prices up. Expect to pay £3-4 per foot miniature. That’s competitive with Warlord’s own boxes (£30 for seven metal figures!) but you should be able to find miniatures just as good or better for less on this list. Thanks for the excellent review of Japanese miniatures. I have a bunch of the Dixon (Sumo) miniatures. UGH they are never going to see my painting table. A thorough, comprehensive and well thought out review of available miniatures. Have you thought of writing for WI or WSS, this is the sort of well-balanced review they need. Thanks! Matt. That’s the koryu set from Northstar. Great miniatures! I also have a question: have you ever came across any figurine of japanese court lady ? Maybe the AW miniatures ones above? Also try Kensei, Hasslefree, or even Reaper? Not awful and not expensive. I’m still looking for foot & mounted samurais with bow.